The Hydroponic Drip System is probably the most common hydroponics system in the world. They are often used in large commercial greenhouses. Once the network of feeder lines is set up, operation is simple. We like to use the popular Bato® buckets for our top-drip systems, as they are very inexpensive, come with a safety reservoir in the bottom, and are easy to set up on a drainage pipe. The nutrient solution is held in a reservoir. A pump comes on periodically and pushes the solution through a network of "spaghetti" tubing which trickles out at the base of each plant. The excess drainage out the bottom of the pot is collected and returned to the reservoir, where it is reused for the next "watering". The feeding cycle repeats 2-4 times daily and promotes lush growth. Dream Big! Learn to build a large hydroponic Drip System [4X4 growing bed with 8 or 16 pots!] Read all about it here: Simon's Simple Hydroponic Plans. There is a link at the end of the plan series to a nice printable booklet of the process! Not ready for a large garden yet?, Get started below with our small top drip mini-farm [3 pots] free plans! Not into Do-It-Yourself? Perhaps one of these complete kits is perfect for you: VersaGrow 10 plant system or The Eurogrower. Create the ideal tomato garden with Dutch "Bato" Bucket Top Drip Systems. We offer complete gardens that are automated, and do all the work for you. 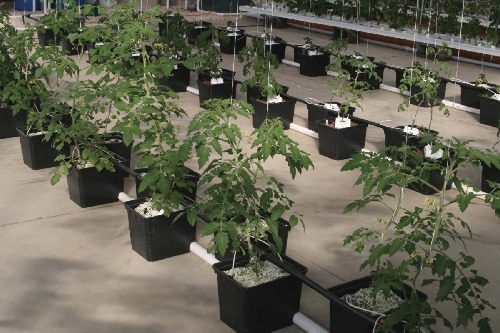 Probably the best hydroponic method for growing prized tomatoes. Ready to "go pro"? 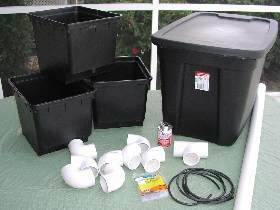 Create a beautiful and lucrative greenhouse PolyMax Dutch Bucket System, complete with plumbing, timers and reservoirs. 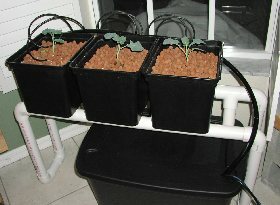 This system is by far the most ambitious of the 5 “mini-farms” we present in this series. You must follow the assembly directions carefully and pay attention to details. Why go to the trouble? We have found that our top drip systems have produced the most lush and prolific plant growth of all. Also, once it's built, it's pretty low-maintenance. We have designed here a small hydroponic drip system that supports 3 large growpots (Dutch Bato Buckets). 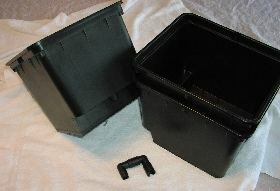 We love Bato buckets because they are inexpensive and have a built-in safety feature. A small reserve of nutrient solution is always held in the bottom of each pot. In the event of a power failure, the plants will not die, but can live off the reserve for a couple days. Top drip Batos form a great, dependable hydroponic unit. This garden cost about $135 (not including a lamp and food). Most of the materials are available from Home Depot or Walmart. A few items must come from a hydroponics supplier (but we give you a good cheap source). PVC pieces: 1½” schedule 40 pvc pipe: Two 10 foot pcs of pipe; 8 elbows; 1 “t” piece; Tip: (buy 2 extra elbows and 1 extra T-piece in case of gluing mistakes [Home Depot]) The connectors same size as pipe: 1 1/2"
One 4 oz. can of PVC cement (gold label) [Home Depot] Don't get blue glue. One brick of coco coir & small bag of LECA (Hydroton or clay balls). More on this and ordering info later in the Tips 'N Techniques section. Power drill; 1-3/4” or 1-7/8” & 2-1/4” hole saw drills & 7/8” and 1” spade drill bits (Borrow a hole saw kit or buy one, you will definitely use it again). Hacksaw, pvc pipe cutter or power saw to cut the PVC pipe. The heart of the Bato bucket is the built in safety “reservoir” for nutrient solution which rests at the bottom of the pot. The bucket has a “cutout”, allowing it to sit on 1-½” PVC pipe, into which you drill some drainage holes.